Snippets of Time: Carrots anyone? he just screams "cool dude". I am lovin this little guy!!!! out all the other fantastic digi images she has to offer!!! All colored with Copics as the base and highlighted with Prisma pencils. branch punch for the tops. cute card I love the little brads. You really colored him well. looks like he could jump off hte page. Thanks guys :) The carrots aren't brads....I drew them, colored and cut them out...then used the Martha Stewart branch punch for the tops. LOVE it!!!!! Awesome job. Love the color combo and the punch! You have suchs talent. I dont know how many times I have told you of how jealous I am of your skills but, I am. Keep up the good work. You make such wonderful cards! This is just so cute! You should really think about selling them somewhere if you havn't already! This is so fantastic!!! The extra touches of the carrots is so great and you made them yourself!!!! Wow!!!! 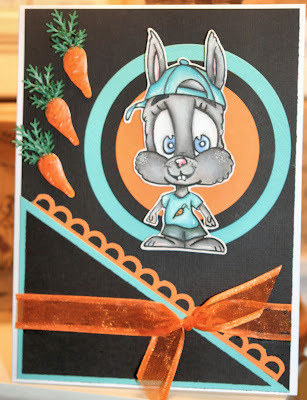 How cool - the layout and carrots are so neat and I love how you colored him in! This is awesome! I love your coloring. Hugs! This is adorable- I LOVE this image! way to cute. love your colors.